Weighs 25 to 30 % less than other materials. Soft velvet surface touch and easy to trim edges. Available with or without non-stick coating. 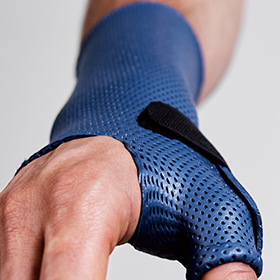 Creates lightweight orthoses, even in case of very large equipment designs. Easy moulding of orthosis to anatomy. Easy to handle and perfect control of material during moulding. Allows to be stretched sufficiently in order to position the material correctly and hold it in place during splint fabrication. The non-coated version sticks temporarily to itself. All attachments and outriggers can be adhered with maximum ease when using dry heat. The coating for the NS-version prevents the material to stick onto bandages or cotton lining. Time-saving. Avoids waste of material. Excellent material choice for all types of small, medium and large orthoses. Especially recommended for patients with loss of strength, and/or fragile and sensitive skin, for example, for elderly persons and pediatric or rheumatic treatments. Lightweight base for all attachments. Ideal splinting material to fabricate post-surgical orthoses. 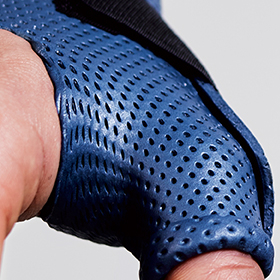 This orthosis gives an extremely comfortable immobilization and stabilization of the complete thumb column. It can serve for the treatment of De Quervain tenosynovitis, rheumatoid arthritis, basal joint osteoarthritis, thumb sprain and pre- or post-operative thumb management. A specific design for preventive and corrective orthotic fabrication of the stereotype rheumatoid hand. Both antero-posterior and latero-lateral deformities of wrist and fingers, as well as thumb deformities, are easily realigned. 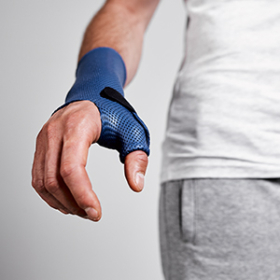 A traditional wrist and thumb immobilization orthosis for very acute joint and tendon inflammations. This orthosis gives full comfort thanks to its circumferential design and long lever.